It has been very hot this week in Phuket, humid too, and with isolated thunderstorms almost every day. The temperature into the mid 30's Celsius... For Americans in the audience, I should explain... 35 degrees Celsius = 95 degrees Fahrenheit. For nerds in the audience, that's 308.15 degrees Kelvin.. but you know that already. You should not be surprised to see a bit of rain in Phuket at this time of year. The air is hot and thick, and all that moisture in the air has to go somewhere... it goes up, it forms clouds and finally the clouds condense to form rain. Hey, this be tropical livin' - we like a bit of rain, and really it should not stop you from doing anything.. after all, the rain is warm! Not good for photography though. My old friend Kerry arrived on Tuesday night and he's a bit of a photo "semi pro". And he's got a new camera, so I have bought his old one, a very nice Canon EOS 20D, which 4 years ago was the top of the range model, so is a very nice camera indeed. Both of us were hoping for good weather on Thursday. I took a day off so we could head out in search of pictures. We drove up to Phang Nga and the famous monkey cave with a large reclining Buddha inside the cave - Wat Suwan Kuha - we just went a few weeks ago. The idea was to see the temple and then head to Bond, James Bond Island by boat. The weather decided to be wet. 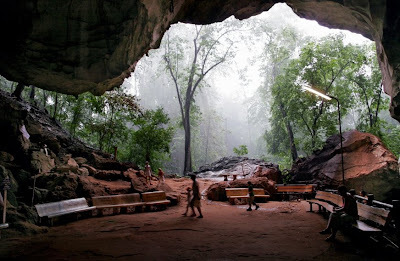 The photo below shows the wet weather outside the cave. 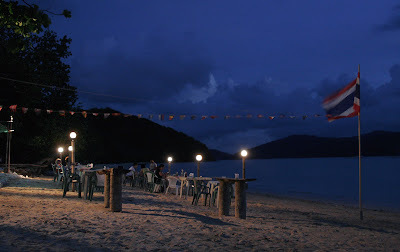 I was working again yesterday but we all met for dinner at The Beach Bar at Cape Panwa to the southeast of Phuket Town. Not too many places like this in Phuket. Keep it a secret, please. It was a dry evening, but there was thunder around us, and a little before we left the wind started to pick up, the air was fresher and I do believe it must have rained at Cape Panwa very soon after we headed home.